According to Scotland's Sunday Herald Royal Mail is marking the opening of the new Queensferry Crossing across the Forth of Firth with a nationwide slogan postmark. The postmark - which says "Official Opening of the Queensferry Crossing Summer 2017" will appear on millions of items of stamped mail across the country over the next few days. The £1.35 billion bridge, which opens to traffic on August 30, was officially handed from the contractors to the Scottish Government on Monday night. All mail posted across the UK between August 30 and September 6 will be stamped with the special postmark. Which makes it the last slogan for August and the first for September. I've seen no announcement from Royal Mail: given that the official opening is today, 30th August, we may find that the postmark is applied to all mail delivered "between August 30 and September 6". It was only used in Integrated Mail Processors (IMPs), so it was not used in Scotland! Aberdeen, Edinburgh and Glasgow only have Intelligent Letter Sorting Machines (iLSM). 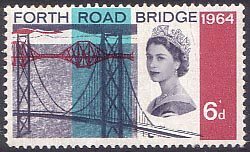 Fifty-three years ago the opening of the Forth Road Bridge was marked by a special stamp designed by Andrew Restall. 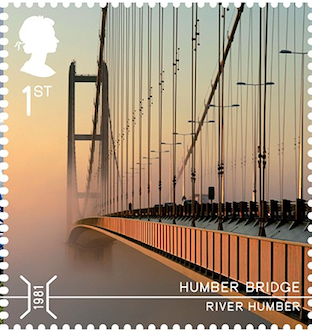 If Royal Mail had chosen to mark the opening of this new bridge with a stamp it would undoubtedly have been arty photographic (like that for the Humber Bridge), now that multi-colour printing is the norm, and printers no longer need to produce a plate for each colour used. The first example of a new slogan for the NHS Blood and Transplant service has appeared from Nottingham Mail Centre, and this (like Bristol reported earlier) has the date separators changed to oblique strokes - 05/09/17. The same slogan has been seen from both Peterborough and Norwich mail centres but with smaller text and 9 wavy lines rather than 11. Oddly, I didn't see anything about this in Boots the Chemist yesterday, but looking at the website I can see why! Once again, Norfolk is a desert, with the nearest testing station being 41m/66km away in Glemsford, Suffolk, though the one closest by time (maybe) is Addenbrooke's Hospital in Cambridge, but only from 10 am - 3.30 pm. Doesn't seem much chance of catching people of working age with these times. As indicated in the quote from 'myRoyalMail' above, there are two different health campaigns at the same time. So now I am able to show the 'other' one for National Eye Health Week, in both formats. The impressions from Chester and South Midlands Mail Centres are not very good, but the text shows clearer on the last one (from Aberdeen), which was taken on a phone. Yes, the second update today. 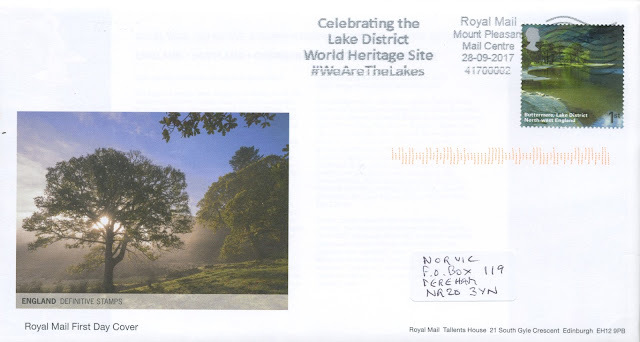 I understand that Royal Mail will be marking the new status of the Late District as a UNESCO World Heritage Site with a nationwide special slogan postmark used on 2nd class mail on 27 September and on 1st class mail on 28 September. This is the wording, and my guess is that the line-breaks will make it look something like this. Examples, please, if you get them! Several people have provided copies of this slogan, but none is a particularly good example, but here is one from South Midlands Mail Centre pending arrival of better ones. Thanks to JG,MC - and DR who tried to get one but got Poetry Day instead (see below)! UPDATE 12 October. A friend has sent this England Definitive fdc with the 2006 'Buttermere, Lake District, stamp with the WHS slogan. It's just what collectors would have wanted, but cannot guarantee - as DR proved. * The GCA is the trade association for the greeting card industry. The voice of the card trade, our mission is to represent, protect and promote our wonderfully innovative sector. The GCA has been working for the greeting card industry since 1919 and today comprises over 450 member companies, large and small. As contributor 'Anonymous' writes, "another day another postmark". MyRoyalMail reports that today is National Poetry Day. "The postmarks will be published on millions of letters and cards delivered nationwide and will feature the words, ‘National Poetry Day 28 September 2017'.". UPDATE: Thanks to BE I can now show one version of this postmark, from Peterborough mail centre, 2nd class posted on 26 September. DR tried for the Lakes postmark above, but got Poetry Day 2nd class on 27 September instead: a pity as his is from Lancashire & South Lakes MC. Note also that this MC is also using the / separator in machine #1. As always we are happy to publish pictures of any new postmarks. Unless something else has crept in at the end of this week, new postmarks will be in the October post. 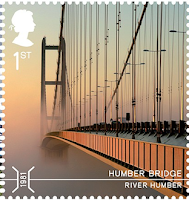 Perhaps Royal Mail will feature the new Queensferry Bridge on next year's Europa issue as "Bridges" will be next year's theme. Just checked some previous envelopes and earliest I have for oblique strokes from Bristol is 26/01/17 on Machine 1. Has anyone actually seen a Queensferry Crossing slogan? Following my repeat of your request in the October post, we now have one added here. It wasn't used in Scotland!